Good Afternoon 2 U! A lot of changes going on in blog challenge land right now. Nothing ever stays the same forever and most of the time change is usually good. Mixes things up a bit. That's why one of the sayings I hang onto is, things only last for a season. (That's the short version) I'm going to go with the flow and keep having fun. 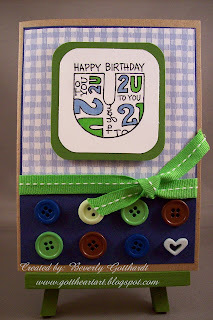 The sketch at Card Patterns and the Challenge Break Out The Buttons! at Our Creative Corner both started Saturday and this card immediately came to my mind, what a perfect combo.Crazy 4 Challenges and Creative Inspirations rounded out the project very crisply. Our Creative Corner OCC-Break Out The Buttons! Creative Inspirations Challenge 55-Green, Brown, & Blue! Supplies: Kraft Card Blank 4" X 5 1/2" Paper Reflections, Papers: from my scrap stash, Stampin Up-Whisper White, Stamp: Stampendous-Two You, Ink: Ranger Archival Ink-Jet Black, Bic MarkIts markers, EK Success small corner rounder, my button stash, ribbon-Offray, pop dots. Adorable card! Thanks for playing at Card Patterns! Wow, fabulous work Beverly. 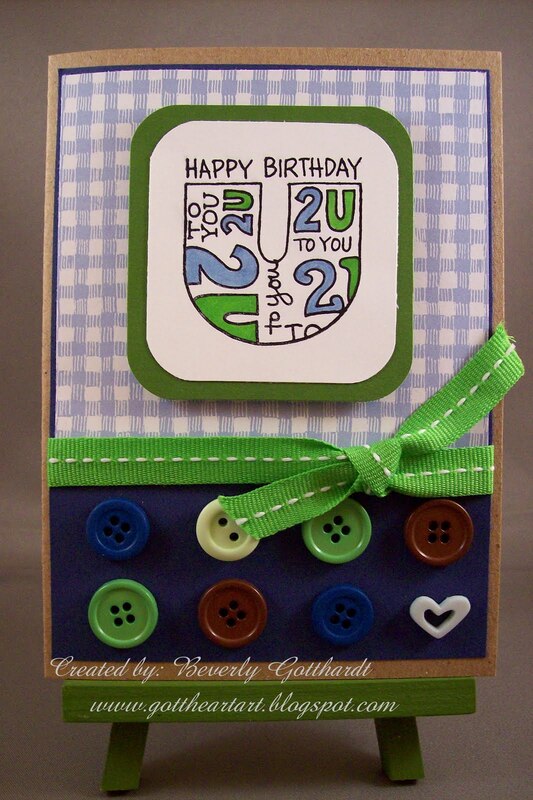 I love the bright, crisp colors and that lot of gorgeous buttons! Great job on the challenges. So happy you could join in the fun this week at Our Creative Corner and Creative Inspirations! What a FUN card! Thanks for "breaking out the buttons" for this week's OCC challenge!! !